Here’s ‘volcano’ soap cut and ready to cure. 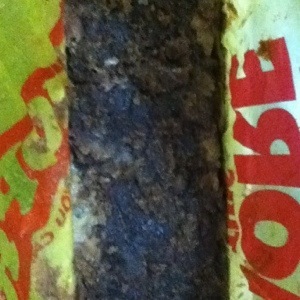 It looks so rustic like drusy quartz. Smells like chocolate brownies for real. I can’t tell you how much I like how this soap turned out! This batch is unscented. Il be making a bigger batch of this soon. This one only yielded 6 chunky bars of soap. I decided to make an oatmeal milk and honey soap today after about a month off. Everything seemed to be going well although my lye water was hotter than I would normally use. I poured the creamy light brown batter into my soap mould and went in search of a spoon to do a fancy top. At first I was shocked how plasticky-hard the soap had become then I saw it split open and bubble out dark chocolate colored spongy soap. Immediately I pulled up the edges of the bag I was using as a liner and disaster was averted, thank God! It could have been so much worse. After the initial shock and panic, I now feel like an experienced soapmaker! Ironic. What went wrong? ALL the ingredients except the Shea butter contributed heat: PKO, Pomace, Honey, Milk, Chocolate brownie oatmeal, hot lye water, seriously hot tropical weather! What to do next time… SOAP COOL!!! I’ve not made any soap in a couple of weeks but I’ve had the opportunity to use the ones that have cured. Orange infused Castile soap: after 4 months of disciplined waiting, this soap is now ready to use. When I bathed my baby with it a couple of days ago, a light fragrance enveloped us both. It made a lovely creamy lather and its a very hard chunk of soap! Lovely. Milk of Nature (special order): this cured into a very bubbly herby soap. My husband had me pack him two bars for his last trip…he didn’t want to risk running out. I was able to sneak out a bar for a friend/customer. Mocha Spice: Oh wow! 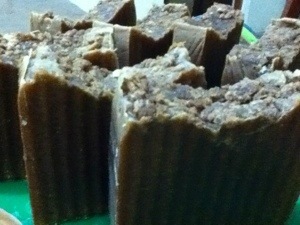 My first cocoabutter soap, with papaya oil. Nice hard bar. Very creamy and bubbly lather. The coffee comes into its own under a hot shower. I’m reluctant to let these out of my sight! Neapolitan: I gifted a bar of this to a new friend. She now wants to know how I made it (wants me to teach a class) and says ‘I’m a customer’.